Players can now get their hands on a physical tarroka deck of cards produced by Gale Force Nine. 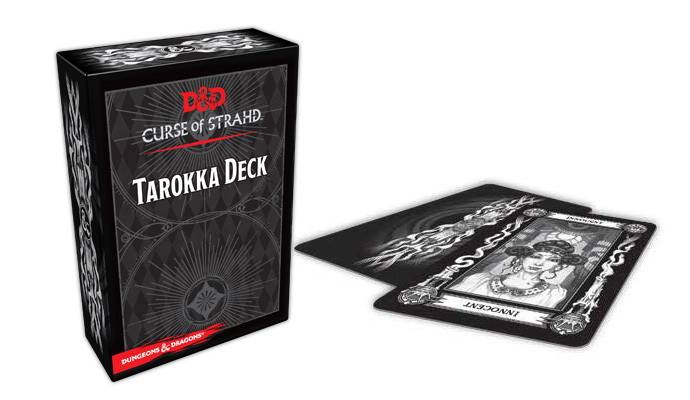 The tarokka deck is a powerful tool for both Madam Eva and for Dungeon Masters running the Curse of Strahd adventure, available now from Wizards of the Coast. By using the tarokka deck to randomize locations within the adventure, Dungeon Masters can customize each party’s exploration of Barovia, allowing Curse of Strahd to be replayed for years to come. In the cursed land of Barovia, the people are melancholy, misshapen and grotesque, living in fear of the wolves and other creatures that serve Strahd’s evil will. The only hope for the trapped adventurers is to heed the warnings of a mysterious fortune-teller named Madam Eva. Drawing random cards from her tarroka deck, she directs adventurers to search Strahd’s domain for artifacts and allies to help the master of Castle Ravenloft.